The Chinese may be calling 2012 the year of the dragon, but I’m going to affectionately rename 2012 as “The Year Of Yeast”. I hope you’ll all RISE to the occasion and bake something warm and yeasty in your own kitchen soon. 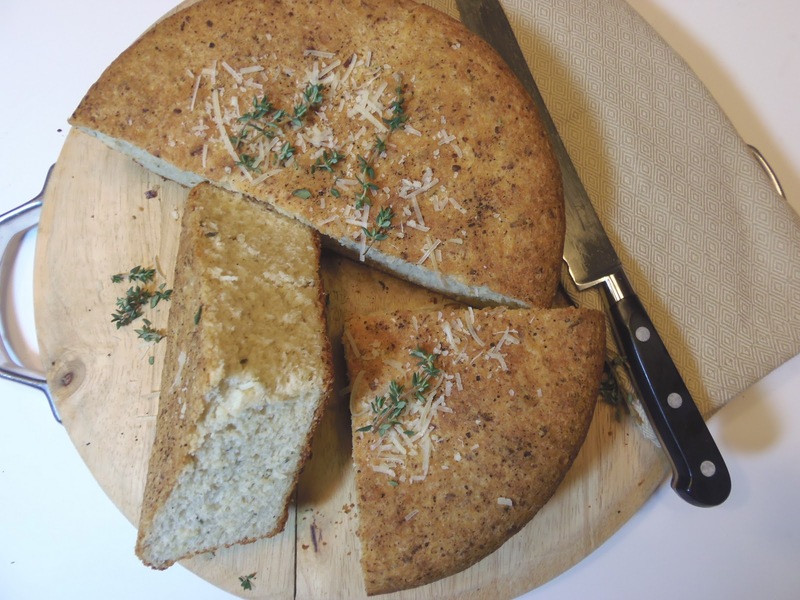 As a matter of fact, why not put this “Parmesan and Thyme Peasant Boule” at the top of your list? I adapted this boule from Abby Dodge in her wonderful series of #baketogether recipes. Every month Abby posts a specific #baketogether recipe on her blog and has a host of wonderful bloggers (and lovers of baking), bake along with her. Then being the giver she is, Abby actually encourages thoughtful creativity and inspires home bakers (like me) to put our own touch and twist to one of her delicious concoctions. They’re Abby’s original recipes but she encourages us to make them ~ our way! You don’t need to tell me twice!!! 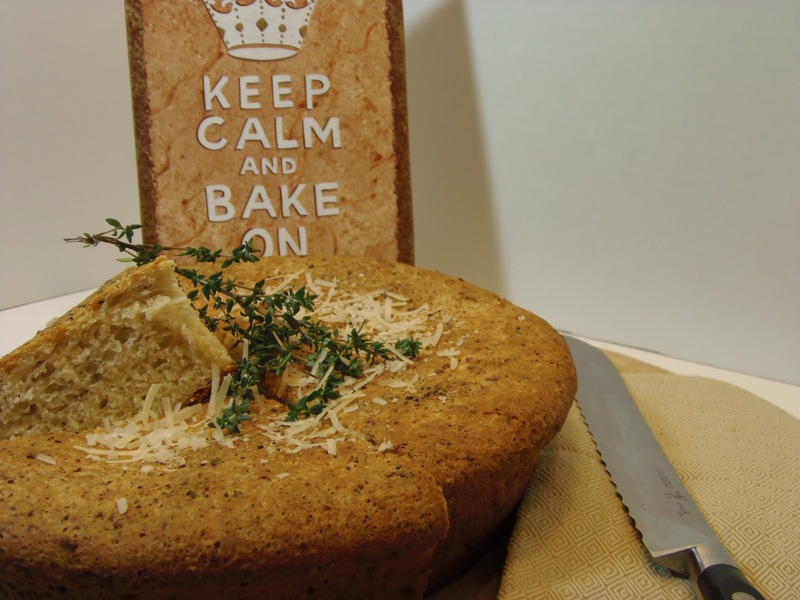 -In a large bowl of an electric stand mixer, whisk the flour, yeast, sugar, salt, baking powder and thyme leaves. -Allow the dough hook to knead the dough for approximately 5-7 minutes until the dough is smooth and elastic. 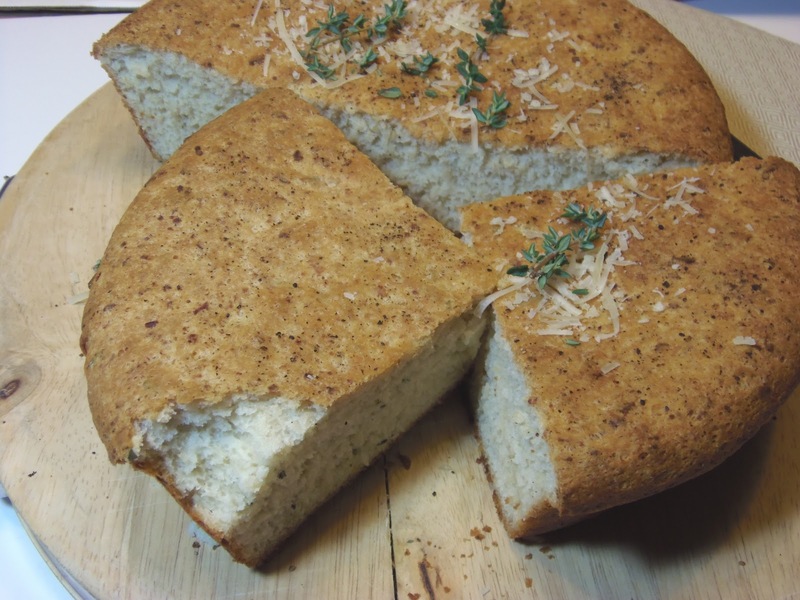 -Add the shredded Parmesan cheese and allow the dough hook to to continue kneading the dough until all the cheese is incorporated evenly throughout the dough. -Remove the dough from the mixer bowl and add it to a lightly greased bowl for it’s first rise. -Oil the top of the dough and cover the bowl with plastic wrap. -Allow the dough to rise in a warm place in your kitchen (I like to use my oven which was preheated to 200 degrees for a few minutes and allowed to cool slightly before the dough is added). This will take approximately 45 minutes to an hour before the dough had doubled in size. 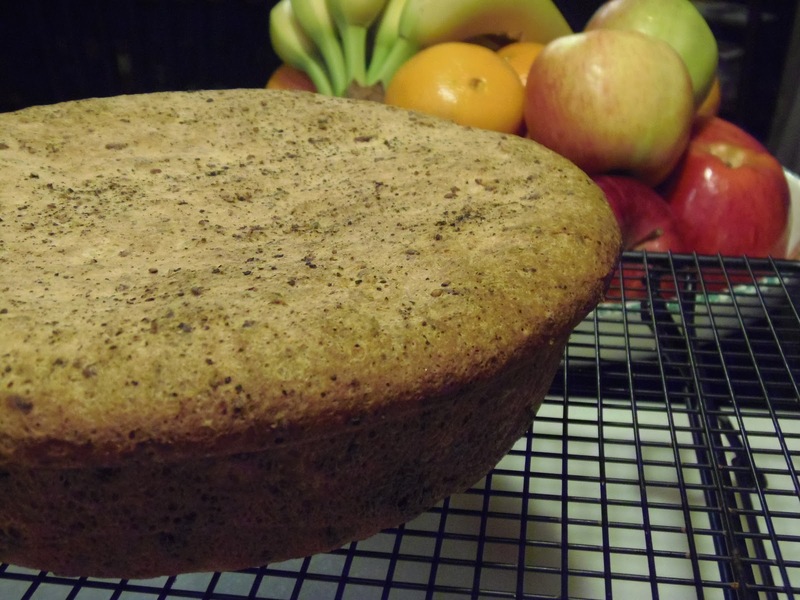 -Generously butter a 8″ round cake pan (a smaller diameter pan will give your bread more height, but I only have 8″ in my kitchen). -Punch down the risen dough to deflate it and, placing the cake pan on top of the bowl, flip your dough out into your cake pan. -Use the remaining butter to brush the top of your boule and sprinkle with the fresh cracked black pepper. -Allow your boule to rise, once again, in the warmed oven for approximately 30-40 minutes until it has again doubled in size and takes up all the space in the cake pan. -Remove the boule and preheat the oven to 375 degrees for baking. 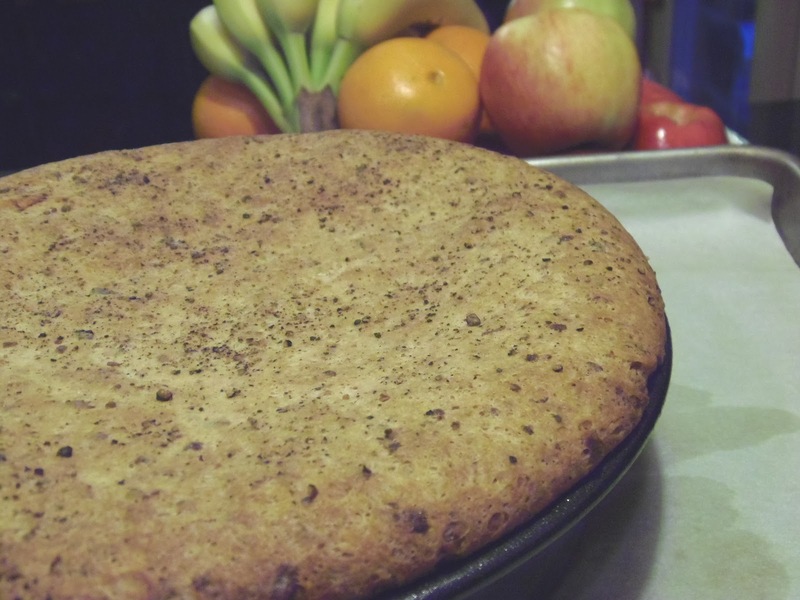 -Bake for approximately 40 minutes and the top is nicely browned and sounds hallow when tapped with your finger. 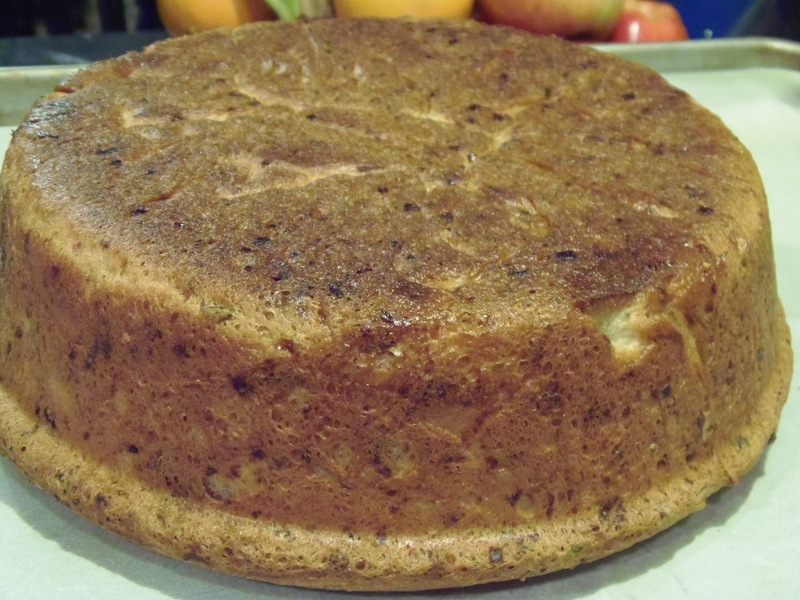 -Remove to a cooling rack and remove the cake pan as soon as possible to prevent a soggy bottom on your boule. There you go, easy peasy and ready to please…see? (LOL, sorry for that!) Yeast breads make me giddy!!! You’ll see in the last photo that I just couldn’t keep my paws off of this bread. I had to sneak a taste as the aroma was causing my head to spin! Thanks for the recipe Abby! I can hardly wait to see what’s baking for next month!!! I'm making a second loaf even as I read. Savory. With herbs from my garden. Well, the one herb that manages to survive the cold. Thyme. and some Parmesan..I might have also added a bit of garlic. Great minds? I hope so…smells terrific I know that! ooo how wonderful! I can't wait to try this! Thank you for the recipe. It looks delicious! Thanks for taking the time to comment ladies. I really appreciate it and am glad you enjoyed this recipe. I just had a slice (maybe two) for lunch and it is just as good the next day. Well you are certainly rising to the year of the yeast breads! This is one beautiful looking loaf, love the color of that crust and I can imagine how wonderful it must have smelled baking away. Aaahhh, I can only imagine a big slice of this aromatic bread with a bowl of soup. Great recipe. I've never heard of this before, it would be great with soap right? Sounds like a delicious piece of bread. I enjoy working with yeast. Black pepper is a pretty touch. I like what you wrote: "aroma was causing my head to spin." Isn't that the truth? Warm bread is one of the best fragrances ever.